"Being something of a technophobe and a secret 21st Century Luddite, I am very pleased to have Mike Caddy on my side, to guide me though the minefield that is 'Website'. As a creative person himself (see www.vitreus-art.co.uk) he understands the needs of artists and has directed me through the setting up and management of my Website without any of the distress and vast expenses that I had anticipated when first thinking of investing in this project. His terms are very reasonable and I have received many compliments on the ease with which the public have been able to enter and navigate the site. I have even learned some of the jargon!!" Most of my packages include regular HTML emails sent to your email list. 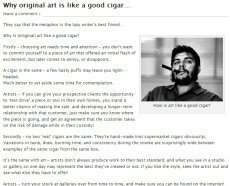 My blog on Art & Marketing covers a wide range of subjects of interest to artists and craftspeople, sometimes, serious, sometimes irreverent. Visit my stained glass website for an example of a recently refreshed site with rich content and e-commerce both for selling art and taking bookings for workshops. 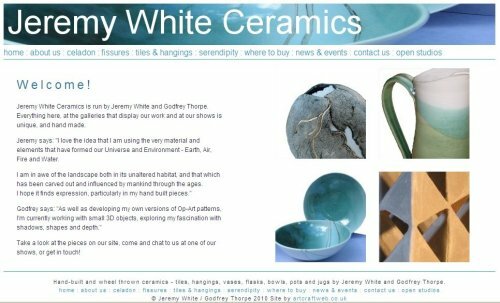 For www.jeremywhiteceramics, a clean look was called for, highlighting four key areas, and allowing for expansion later. Since the original design several new sections have been added without disturbing the original look of the site. 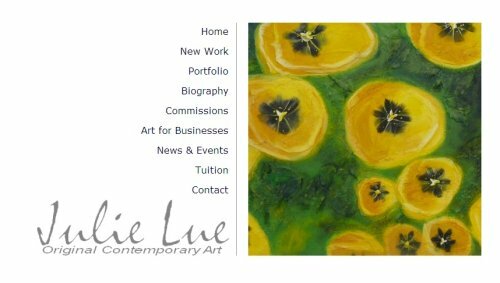 For Julie Lue's website, Julie had some specific ideas about layout, colours, and a font for her 'signature' logo. The tone of the site is 'cooler' than my own sites, but, again, that was the preference of the client. Julie creates high-end bespoke art for commission, and a key objective of the site was to communicate the detailed process of incorprating the client's ideas in to the final artwork. May Ayres creates powerful, though-provoking, socially observant art with stong messages. May provided a series of ideas for her site drawn from a range of inspirations, but the resulting site is 100% May. Dark, intense, and featuring a number of reduced-colour and black-and-white images, the site communicates the gravitas of the work. 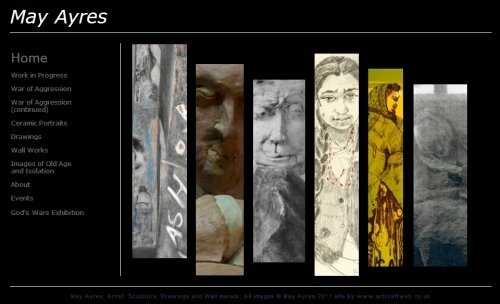 The site also includes custom slideshows created to act as a retrospective for a high-profile exhibition featuring more than 50 individual images woven together. 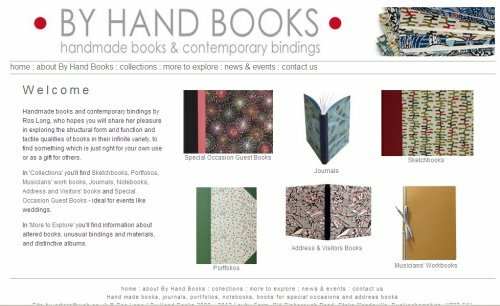 This site for By Hand Books was created along a simple theme under time pressure - the client's existing site hadn't been updated but the original web designer was no longer able to work on the site. The brief was to build a new site, including shooting a significant amount of new photography in just a few weeks, to go live before a major art event. The site layout was created to allow the display of a large range of work without any individual pages becoming unwieldy or visually confusing. If you're ready to find out about my website packages, visit the Your New Website page. For further info and answers to questions you may have, please see my FAQ page.